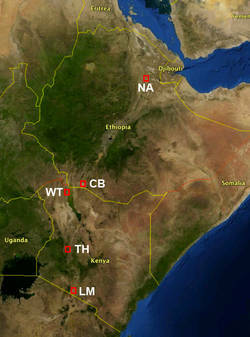 The HSPDP drilling project considers the scientific opportunities and technical challenges of obtaining sediment cores from several of the most important fossil hominin and early Paleolithic artifact sites in the world, located in Kenya and Ethiopia. Our objective is to drill in near-continuous sedimentary sequences close to areas of critical importance for understanding hominin phylogeny, covering key time intervals for addressing questions about the role of environmental forcing in shaping human evolution. These sites are all currently on-land, but consist of thick lacustrine sedimentary sequences with high deposition rates. Therefore, the proposed sites combine the attributes of relatively low cost targets (in comparison with open water, deep lake sites) and the potential for long, highly continuous and informative paleoenvironmental records obtainable from lake beds.